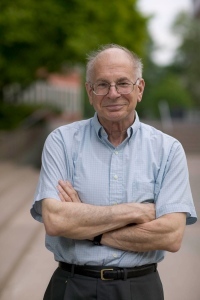 Daniel Kahneman issued an open letter to researchers doing social priming research, which has become the subject of skepticism after some studies were found to be fabricated and others were not able to be independently replicated. His letter offers advice to scholars about how to address the situation: Find out the truth through extensive replication and announce it. I write this letter to a collection of people who were described to me (mostly by John Bargh) as students of social priming. There were names on the list that I could not match to an email. Please pass it on to anyone else you think might be relevant. I am not a member of your community, and all I have personally at stake is that I recently wrote a book that emphasizes priming research as a new approach to the study of associative memory – the core of what dual-system theorists call System 1. Count me as a general believer. I also believe in a point that John Bargh made in his response to Cleeremans, that priming effects are subtle and that their design requires high-level skills. I am skeptical about replications by investigators new to priming research, who may not be attuned to the subtlety of the conditions under which priming effects are observed, or to the ease with which these effects can be undermined. I believe that you should collectively do something about this mess. To deal effectively with the doubts you should acknowledge their existence and confront them straight on, because a posture of defiant denial is self-defeating. Specifically, I believe that you should have an association, with a board that might include prominent social psychologists from other field. The first mission of the board would be to organize an effort to examine the replicability of priming results, following a protocol that avoids the questions that have been raised and guarantees credibility among colleagues outside the field. * Assemble a group of five labs, where the leading investigators have an established reputation (tenure should perhaps be a requirement). Substantial labs with several students are the most desirable participants. * Each lab selects a recent demonstration of a priming effect, which they consider robust and most likely to replicate. * Set up a daisy chain of labs A-B-C-D-E-A, where each lab will replicate the study selected by its neighbor: B replicates A, C replicates B etc. * Have the replicating lab send someone to see how subjects are run (hence the emphasis on recency – the experiments should be in the active repertoire of the original lab, so that additional subjects can be run with confidence that the same procedure is followed). * Use technology (e.g. video) to ensure that every detail of the method is documented and can be copied by others. * Pre-commit to publish the results, letting the chips fall where they may, and make all data available for analysis by others. This is something you could do quickly, and relatively cheaply. The main costs are 10 trips, and funds to cover these costs would be easy to get (I have checked). You would have to be careful in selecting laboratories and results to maximize credibility, and every step of the procedure should be open and documented. The unusually high openness to scrutiny may be annoying and even offensive, but it is a small price to pay for the big prize of restored credibility. Success (say, replication of four of the five positive priming results) would immediately rehabilitate the field. Importantly, success would also provide an effective challenge to the adequacy of outsiders’ replications. A publicly announced and open effort would be credible among colleagues at large, because it would show that you are sufficiently confident in your results to take a risk. More ambiguous results would be painful, of course, but they would still protect the reputations of scholars who sincerely believe in their work – even if they are sometimes wrong. The protocol I outlined is just an example of something you might do. The main point of my letter is that you should do something, and that you must do it collectively. No single individual will be able to overcome the doubts, but if you act as a group and avoid defensiveness you will be credible. Kahneman on the storm of doubts surrounding social priming research was written on October 5, 2012 and filed in Gossip,Ideas,Research News.